These Mexican cities received the title of UNESCO World Heritage Sites thanks to their beauty and cultural richness. Get ready to plan your next trip! Our entire planet is full of sites for visitors to marvel at; which is why unesco has given a special title to places which have a particular cultural or natural importance for humanity’s heritage. As of 2016, the list of World Heritage Sites contained 1,052 different places; of which 200 were cities with great historic, architectural and urban value. In Mexico, San Miguel de Allende, Guanajuato, Puebla, Querétaro and Mexico City (for the Historic Downtown and the Magical Neighborhood of Xochimilco) have been awarded this title; but there are also other Mexican cities which you might not be expecting included on the list! Campeche received the title “the Historic Fortified City of Campeche” thanks to its 17th- and 18th-century military architecture. In fact, this is the only walled city in Mexico, with more than 500 m (1640 ft.) of walls, two forts and eight bastions. What’s more, this is an excellent example of a Colonial port city with homes built in Andalusian and Colonial Baroque styles which are still standing. This water-front city in the state of Veracruz, also known as the “Pearl of Papaloapan”, is one of the most beautiful cities in all of Mexico and one of the places where Spanish and Caribbean influences intermingle. The Neoclassical architecture from the 18th and 19th centuries is present in the monuments, doorways and hidden corners, all the elements of the city which made it worthy of its World Heritage title. Zacatecas was one of the most important cities in the northern region during the Colonial “New Spain” era and this is why it was named “Most Noble and Loyal City of Our Lady of Zacatecas”. Since then, it has also been given other titles, including “World Cultural Heritage City”. The splendor of the Historic Downtown, the monuments built with pink cantera stone, the maze-like streets and the historic atmosphere are the reasons for which it received these distinctions. 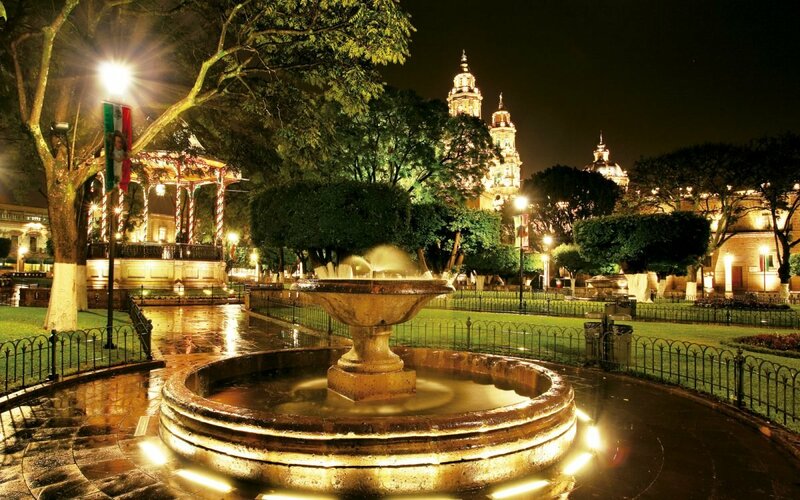 The Historic Downtown of Morelia, comprised of an area of 669 acres, including 15 plazas and 1,113 monuments, is one of the most beautiful cities in the world. The historical richness is invaluable and the ancient monuments stand out for both their beauty and their wide variety of architectural styles. Morelia is just waiting to be toured and admired. The state of Oaxaca is one of the most incredible places in Mexico thanks to its traditions and culture, and the capital has an incalculable value. The mixture of stunning religious and civil architecture dating from the 16th century and the Historical Downtown which has maintained its original form since 1529, have made this a deserving recipient of the title granted to it by unesco. Of course, the close-by archeological site of Monte Albán is another place which has also been recognized by unesco. More info on Mexico: here.